Continuing our epic month of last foie-consumption, Wednesday night we headed to Txoko, for yet another special foie dinner! Txoko has been running these dinners every Wednesday night for a few months now, but I've somehow never been able to make it, always having other commitments, or the one time we actually had reservations and plans to go, one diner wound up in the hospital with apendicitis! It is like we were doomed to never make it! I'd read some amazing things about their seared foie gras preparation (seared a la plancha of course), so I really, really wanted to fit this dinner in. Literally months worth of attempts later, we finally made it! The vary the menu each week, but it seems to usually include a cold preparation to start, the signature seared foie in some form, and always finishes with a foie gras ice cream. They do not announce the menu details until a few hours before, but recently it has included some things I'm less than excited by (lentils, hen, squab, etc). I was absolutely thrilled when I saw the menu we'd be trying, as it featured seared scallops as the main dish - the non-foie dish from their regular menu that I'd read great things about (and a favorite ingredient of mine), and it included their seared foie as well! It sounded like a dream menu. This was, hands down, the best value I've had for any foie dinner, or foie in general. And an amazing value for the drink pairing as well. But it wasn't just a good value, I would give it a raving review even if it were priced higher. Quality ingredients, prepared well, generous portions, creative pairings ... such a gem! I had an incredibly hard time ranking the dishes this evening. They were all very good. In the end, it came down to subtleties. Since we'd just had another foie dinner two days before at The Village Pub, I can't help but draw comparisons. They were both four courses, starting with a salad that involved a foie torchon, a second course of seared foie, a main course with foie as an accent, and then a foie based dessert. But the portions of foie were much, much larger at Txoko. This is particularly notable given the price. Txoko's entire four course meal was $65. The Village Pub's was $115. I was absolutely shocked at how generous the foie servings were at Txoko, just as I'd been a little shocked at how small they were at The Village Pub. And, it isn't like they are sourcing their foie from somewhere shady, it was all quality product from Sonoma Foie Gras (although they'll be switching to Hudson, since Sonoma has shut down production due to the ban). All of the other components to the dishes were fresh and seemed very high quality as well. The drink pairings were another incredible surprise. For only $35, you received four generous pours, basically full glasses, and an additional sparkling wine to start. Again, a fantastic value compared to The Village Pub's $68 wine pairing of not even half glasses with each course. Granted, these were less high end wines, but they are each normally ~$9 per glass on their regular menu. Furthermore, the pairing included a sparkling, a white, a sherry, a red, and a madiera! Such diversity, not only sweet wines, and no tokaji or sauternes in sight! Now of course, they are totally different restaurants. The Village Pub is a fancy, Michelin starred, formal atmosphere, whereas Txoko is a casual neighborhood, rustic feeling restaurant (although, hmm, both interiors prominently feature wood finishes, just totally, completely different!). 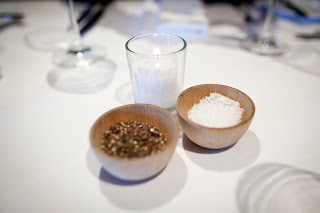 It was a departure for us to be somewhere more casual, and it was really refreshing (of course, it meant no amuse bouches, mignardises, or take home treats). We were a large party of 8, and were seated at a huge wooden table in front. All other parties in the restaurant were smaller than ours. We were really surprised that they didn't automatically add gratuity on to our bill. They handled our group size fine, and I'm definitely filing this away as a go to place for a group this size. We all ordered the foie dinner, except for one diner, a pescatarian who joined us (I'd told him about the famed scallops!). Two of us opted to split both a dinner and a wine pairing. They nicely split the wines for us before serving, but left us to our own devices to split the food. Not a big deal, as they always brought out a share plate. Service was good, on the casual side. Unlike the fancier places we've been lately, serving wasn't synchronized, but dishes were served pretty quickly to everyone. They cleared plates away as each diner finished, rather than waiting for us all to finish. I don't think I used to notice this sort of thing, but it was a change from what I've gotten accustomed to, and it struck me mostly when I wanted to try some of another diner's dish, and I no longer had silverware with which to do so. Our waitress was friendly and fairly attentive. There was a slightly longer than usual delay between courses two and three, but we were enjoying ourselves and the plentiful wine, so this didn't bother us. We also got the opportunity to meet the chef at the end, who, like our waitress, was friendly and enthusiastic about the food. I highly, highly recommend Txoko, and their foie dinner in particular. And luckily for you, they just announced that they'll be holding the dinners on Tuesday - Thursday nights for the rest of the month, so you don't need to go on just Wednesday! Go. Now. I know I'll be going back as soon as I possibly can! "Clover Club": Gin, lemon juice, egg white, house made raspberry puree. $10. Txoko is also known for their cocktails, and the space includes a decent size bar, with bar snacks. A bunch of my fellow diners started with cocktails, including this one. I tried it out, but it wasn't really my thing. Very ginny, not sweet even though it had raspberry puree, with a nice froth from the egg whites. To start our meal, we were served a glass of Mont Marcal Cava Brut Reserva '08 before the real drink pairings began. 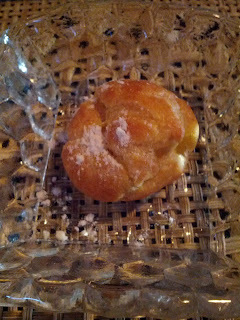 It had a nice sweetness and was a fun way to begin the evening. Everyone needs something to toast with! Foie gras torchon pintxo. $6. We were ordering the 4-course foie menu, but the bar menu had one more foie preparation on it that we wouldn't be receiving, so one member of our party suggested that we all start with this and create ourselves a 5-course menu. Genius on his part! Unfortunately, my photo does not do this any justice. 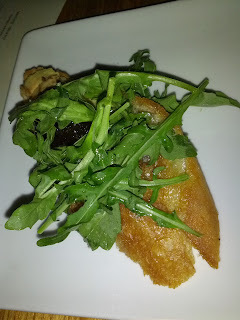 What we have here is a crostini, topped with foie gras torchon, prunes, and arugula. This was an awesome few bites! The crostini was nicely oiled, with the oil enhancing all of the flavors and not being overkill. It worked particularly well with the arugula. I loved how crisp the bread was, and how that crunch paired with the incredibly creamy torchon. Speaking of which, there was a very, very generous slather of the foie gras torchon, which had a really good foie flavor. The richness and minerality of the foie were cut perfectly by the prune, which included a drizzle of housemade syrup reduction, adding the prefect amount of sweetness and making for an amazing pairing. The arugula on top was crisp, slightly bitter, and added a freshness to the whole dish. I still can't get over how much foie was included on this and the fact that it was only $6. Hands down the best value for foie I've ever had, easily beating out the old winner, the duck liver, foie, and bacon pate from Prospect. This set the tone for the evening, ridiculous value for delicious, quality ingredients! My favorite dish of the evening, the second favorite of another dinner, and the third favorite for three others. I'd order again anytime. Soon after we ordered, bread arrived. It was a cold baguette, not notable in any way. I always prefer warm bread. The olive oil served alongside seemed pretty high quality, with good flavor. We all ranked this the least interesting thing we ate all night. Course #1: "Duck Confit Salad" with Foie Gras Torchon Crouton, Egg Yolk, Frisee, Asparagus, Herbs. Given the menu description, I really had no idea what to expect from the first course. "Foie gras torchon crouton" sounded to me like a crouton with foie baked in, so I kinda expected a salad topped with some little foie croutons. And "egg yolk" seemed like it must be referring to a yolk-based dressing. What a surprise this dish was! On the plate was a salad made of fresh crisp frisee, small chunks asparagus spears, and herbs. It was very lightly dressed with a perfect salt level. On top of the salad were a few pieces of duck confit. I've never cared for duck confit before, but this was tender and amazingly flavorful. The egg yolk really, truly was just an egg yolk, served in a shell, topped with some pepper. Cute presentation, but not nearly at the level of the last egg yolk in a shell I had, at La Folie. We were supposed to dress the salad ourselves with it, pouring it on. I didn't really like it, as it masked all of the other flavors. I'm glad I tasted some of the salad without it first. I also felt it added too much richness to the dish, which already had the plenty rich foie in it. The foie gras torchon crouton turned out to be a similar preparation to the extra pintxo that we started with, a crostini topped with a large amount of foie, which you can see better in this photo since it isn't covered up by the arugula. Again, the foie was really creamy, had a good foie flavor, and was a generous portion. The crostini wasn't as toasted in this version. Being the perfect bite seeker that I am, I tried the salad on its own first, and loved it. Fresh, crisp, delicious. I liked it less once I added the yolk, as it overpowered everything else. Then I spread the foie out onto the bread more evenly, and enjoyed bites of just the bread and foie, but it was lacking a contrasting component. So I experimented by adding a little of the salad on top, which worked out fantastically, as the salt level enhanced the foie. Quite a good dish, but it falls down to 4th place due to the yolk for me (the difference between places 1-4 on my list came down to tiny details like this!) It was also the 4th favorite for 3 others and the 2nd favorite of one diner. I'd still order this again, I'd just skip the yolk, or perhaps use less of it. I don't think it was necessary. This dish came paired with a white wine, Can Feixes Blanc Seleccio, Penedes '09. It was slightly dry, not too sweet, but just sweet enough to cut the richness of the foie. A nice pairing with the salad as well. Our pescatarian friend enjoyed one of Txoko's most raved about dishes as his starter, the Mushroom Arroz with Caramelized Fennel, Chevre, Shitakes, and Hen of the Woods. $12 for a starter, $24 for entree. Being an awesome person, he let me sample it so I could include a review here, but I don't have a photo of it. The rice was nicely cooked, still slightly crunchy. It had a fantastic earthiness from the mushrooms. The sauce was very rich. I didn't have any of the chevre since I don't care for goat cheese, but it seems like it was probably needed to contrast with the rich sauce. I didn't really care for this dish, but I'm not really a rice person. Course #2: "Liver and Onions": Foie Gras a la Plancha, Braised Cipollini, Soubise, Chive Oil, Crispy Shallots. Given all the foie gras dining I've been doing lately, it perhaps is not surprising that this was the not first preparation called "liver and onions" I've had recently. The last was at Alexander's, where it was also a seared foie gras accompanied by caramelized onions and crispy shallots, although that dish also included a slew of other components. I was very excited for this dish, as I've read amazing things about Txoko's seared foie in general and because I absolutely love cipollini onions. And how do you go wrong with crispy shallots? This dish lived up to expectations! And it was beautifully plated. The base of the plate contained the creamy soubise sauce, surrounded by chive oil. I didn't find either of these sauces all that necessary, but I think the bread on top likely soaked up a lot of flavor from them. The bread was lightly toasted and oiled, and definitely soaked up some of the foie oils that dripped on it. It was a nice component to the dish. The braised cipollini onions were intensely flavored and just as awesome as I'd hoped they would be. They added the right sweetness to the dish to compliment the foie. The foie was again a generous portion! It was creamy, smooth, clearly a quality piece of foie, with a great sear on it. I see why people find Txoko's searing notable, this was great execution. Mine was served a little less hot than I would have liked however. And on top of that were the crispy shallot rings, tasty, crunchy, a great touch. And some fresh chives. This all came together well, making it the top choice of three members of our group, Emil's second favorite, but only my third favorite (but again, the difference in places 1-4 on my list is subtle, subtle, I just happened to like the other ones slightly more, but this could have inched out the others had it been hotter. I'd still order it again). The pairing with this was not a standard tokaji or sauternes, but instead a cream sherry from the dessert menu! It was really fun to have something different for a change. Emil and one other diner asked to have something else with theirs as they didn't want a sweet drink, and were served a different, far less sweet, sherry with theirs, that they seemed to really enjoy. They really appreciated the sommelier making that change for them. Course #3: Pan Seared Day Boat Scallops with Foie Gras Sauce, Wild Mushrooms, Fava Beans, Potato Coulis. When the menu for the night was published a few hours before, I just about lost it when I saw this dish listed. I love scallops. And obviously I love foie. And wild mushrooms. ZOMG. And I love them even more when together! But I'm so, so often disappointed by scallops. I want them to have a slight sweetness. I don't want them to be fishy. I want them tender, medium rare on the inside. With an awesome sear on the outside. It is so hard to find scallops perfectly cooked, so I was quite anxious to see what would arrive! I've actually had a number of foie gras and scallop pairings recently, like the scallops and foie rossini at La Folie, the impromptu seared scallop topped with seared foie at Fly Trap, or the seared foie gras and seared scallop dish as Micheal Mina, but those all included pieces of seared foie gras. Since our previous course was a large seared piece however, I didn't mind the absence of a large chunk of foie here, and I've had a number of pretty amazing foie sauces recently as well, so this sounded quite promising! And ... it was! Another dish that lived up to expectations! The scallops were tender, sweet, flavorful. Clearly very fresh. They had a nice sear on them, although, I would have preferred even a little more sear (this photo is actually of a fellow diner's scallops, which were less seared than mine). Served nice and hot. Accompanying them on the plate was a potato coulis, basically just a few spoonfuls of the creamiest mashed potatoes ever. I would have loved to have more of this! There were also a few nicely cooked fava beans, some earthy, flavorful wild mushrooms, and crispy fried things (potato strings perhaps?). These components were all good, adding extra flavors and textures to the dish. The sauce was the only disappointment for me. While it had a richness that could only really be explained by foie gras, the foie flavor didn't really come through all that strongly. 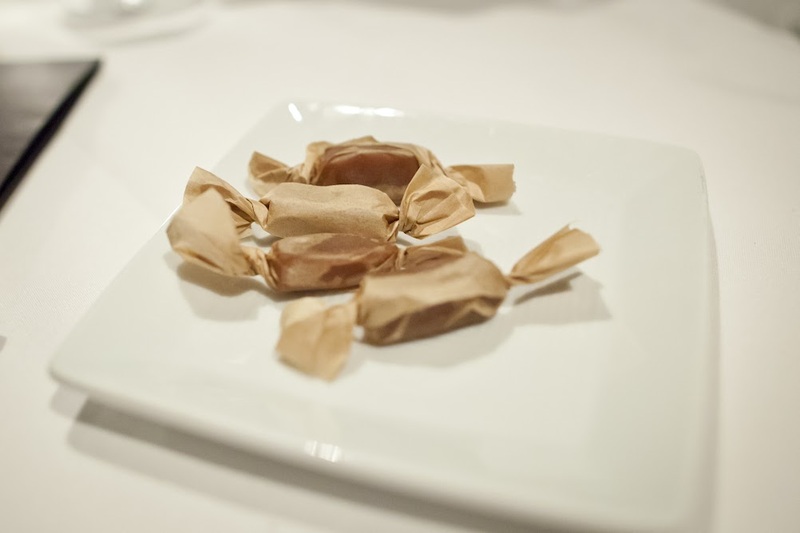 It certainly wasn't at the calibre of the foie gras bourdelaise that topped a recent filet at Alexander's or the insanely amazing foie gras, truffle, and madiera sauce with pasta at Acquerello. I know I was at a foie gras dinner, and if I really wanted more foie at this point, I might have been upset by this dish, but they were well executed scallops, a dish I really enjoy anytime, so I was quite happy. Plus, the previous three courses had such generous amounts of prominent foie, it was nice to see it not as the star ingredient in one course. Our group ranked this one the least consistently, I think based entirely on how much people tend to like scallops. It was Emil's favorite dish, my and one other's second, anther's third, and another's fourth. This came paired with a red wine, Gran Familia Cosecha, Rioja '10. Again, another interesting pairing, and it was nice to get a red wine included in the meal, even though the main course was delicate seafood. The wine was light enough not to overpower the scallop, but complex enough to be interesting. Not pictured is our pescatarian's main dish, the seared scallops from the regular menu (minus the pancetta of course). This was a sizable portion of 6 scallops, for $30. Like ours, they were really nicely executed. He declared them the best scallops he'd ever eaten. They were accompanied by some seasonal asparagus and served atop an absolutely delicious puree. I'm not entirely sure what it was, some kind of root vegetable, but it was creamy, incredibly rich, almost cheesy even, and just awesome. When I go back to Txoko post-foie days, I will be ordering this dish. Course #4: Foie Gras Ice Cream with Prunes in Syrup. And ... foie dessert time! After the downright horrible foie crème brûlée two days earlier at The Village Pub, I was a little less excited for this course than I normally am for desserts. But, I also had the most amazing, mind blowing, fried rhubarb pie with foie gras ice cream at the Fifth Floor a week prior, so I had hope. There was a scoop of the foie ice cream, with sable cookie crumbles, and prunes in a syrup sauce. I believe the prunes were the same ones with the house made reduction that we saw on the starter pintxo. They were very sweet, almost too much for me in this quantity, but, this was a dessert. The cookie crumble was a nice buttery cookie, and I liked having the crunchy bits to mix into the ice cream. The ice cream however was a letdown. It didn't have much foie flavor at all and was kinda icy, not all that creamy. It reminded me a lot of the foie ice cream we had with pain perdue at one of Lafitte's foie dinners. This wasn't bad, but it wasn't very good either. We all ranked this as our least favorite dish (well, besides the bread). It came with yet another interesting pairing, Blandy's 5 Year Malmsey Madeira. I thought this was delicious and really, really enjoyed getting another totally unexpected drink pairing. Our pescatarian friend was too full to order dessert, although the dessert menu had some amazing sounding options on it. When he mentioned wanting something sweet, but not being able to have a full dessert, the waitress mentioned that they have the perfect dessert for people in his situation, an off the menu item, adorable little bite size ice cream sandwiches. $2 for two of them. I didn't try these, but he said they weren't particularly interesting, but that it was nice to have an option to get a tiny bite of something sweet. Chez Spencer was a great experience overall. They have been around for a while, and the menu doesn't change much, so they have clearly perfected the dishes that they do (one diner went there 3 years ago, and the menu was almost identical!). Service was good. The atmosphere was nice - upscale casual, great for a small group or for a date. Sorta open kitchen, SOMA-esque interior with exposed beams, lovely bathroom. Me: the sauces. ZOMG the sauces. Other dinner: the great non-caffeinated roobios tea he discovered, after talking about how he missed black tea/coffee during the meal. Foie Gras 'Torchon': vanilla-scented blackberry compote, pain de campagne. $21. Definitely nice, rich, buttery foie, very smooth. The blackberry compote was flavorful and went well with it. The toasted bread was forgettable but served as a good vehicle for it. Emil really enjoyed this dish and I think could have easily eaten the whole thing himself :) The other diner liked it, but said it wasn't that much better than "really good butter". I thought the flavors all went together well, but I prefer seared warm foie gras over this style. Solid, I wouldn't go out of my way for it, but that is just a personal preference. Pan Seared Sea Scallops: hearts of palm & sauce verte. $19. AMAZING. Excellent execution and flavors. The scallops were cooked very, very well. Lovely crust from perfect searing, but nice and tender on the inside. The spices crusting the scallops were a perfect compliment. The salad and hearts of palm were fine, but forgettable. But the sauce. Oh, the sauce. Described as just "sauce verte" on the menu, I had to ask what it was. Made of parsley, spinach, and ... beurre blanc. No wonder it was delicious. There was a small amount of truffle in here too, providing a subtle earthyness. Did I mention the sauce? Seriously, DELICIOUS. I was very glad to have a roll still sitting around with which to continue lapping up the sauce long after the rest of the dish was gone. Wood Roasted Sturgeon: nameko, honjimegi, chanterelle, pommes crisp & sauce bearnaise. $32. I think this was my first time having sturgeon. Any fish that can sand up to bearnaise sauce needs to be pretty steaky, and that is exactly what this was. Firm texture, but still soft and flaky. Sorta a cross between chicken and halibut? The mushrooms were fantastic. Super hearty, meaty, and just prepared amazingly well. I didn't know mushrooms could taste so good. I have no idea what they did to them (I'm guessing it involves butter), but they were honestly mind blowing. I apologize to the rest of my dining party that I was sharing with, I definitely had way more than my share of the mushrooms! The fish itself was good, the sauces were good, but I wouldn't go out of my way again for those components. But I would for the mushrooms! Wood Grilled Filet Mignon: morels a la creme & truffle butter. $32. More amazing sauces and mushrooms. Filet mignon served over morels in a crazy morel cream sauce with truffle butter (on the side, since one diner is anti-truffle). The steak itself was well seasoned and cooked, but at the end of the day, it was just a steak. The morels were awesome. They'd clearly been cooked in the cream sauce and were infused with creamy goodness. This sauce was the best of the night, sooo creamy, so mushroomy, soooo good. Again, very glad I had bread around to keep soaking up the sauce. The steak was fine, but I wouldn't go out of my way to get it. But I would go very far out of my way for the morels and cream sauce. ZOMG. I'd actually love that sauce over some pasta ... mmm. Warm Chocolate Pudding Cake, flowers of the alps tea anglaise. $9. Decent warm chocolate cake, the inside definitely could have been more pudding/molten. Whipped cream on top was kinda boring. But ... the tea infused cream anglaise ... delicious! Lovely tea flavor, not too sweet. Yes, we ate all of the cream anglaise left over by the spoonful once the rest was gone. The chocolate cake was fairly forgettable, but I'd gladly drink the angalise! Champagne Strawberry Granite: champagne sabayon,pistachio sable cookie. $9. The strawberry champagne granite was refreshing and flavorful and a nice texture. Not too sweet, although I didn't get much champagne flavor. The sabayon was lovely and went very well with the granite. Creamy, custardy, how can you go wrong? A spoonful of both sabayon and granite was a match made in heaven :) Even non-dessert liking Emil enjoyed this. This isn't the sort of dessert I normally order (I'm usually more into chocolate, mouses, warm tarts/pies, cream brulees, etc), but this was really, really nice and has definitely opened my mind up to the possibility of not getting a baked good or super sweet thing for dessert! As you are likely well aware by now, we have been on a foie gras crawl for the past few months, getting in all of our last foie consumption before the ban goes into effect. Restaurants are making this even easier on us, by organizing all sorts of special foie gras dinners. 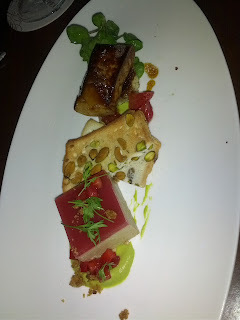 On Monday night, we ventured all the way to Woodside to get our foie fix at the Michelin starred Village Pub. They are running a special foie dinner all month long. I hadn't ever been there before, but many people I know who have rave it about it, and I absolutely adored their asparagus panna cotta at Taste of the Nation. And the menu sounded pretty great! I was excited, particularly for a good Monday night meal, as Mondays are often such bad dining out nights! The place is gorgeous. Dark wood panels on the walls, velvet chairs, exposed beams on the ceiling. So swanky. Something about it made me instantly want a scotch (I settled for stealing a sip of a fellow diner's manhattan instead). Matching the environment, diners and servers alike were far more dressed than their counterparts in San Francisco, with nearly every male in a suit. It was clear that we were out of the city! Our party of four decided to order three foie menus, plus a few other items. The kitchen nicely split the first two courses for us, plating them beautifully. They also allowed me to order only a half pairing of wine, so I could experience all of the wines, but not have as much wine overall (which, it turns out would not have been a problem given the pour sizes). Slightly more surprising was the wine. The pairing was $68 and included 3 fairly cheap white wines and then an incredible red wine. The pours were all really quite small. They clearly choose to put the cost into the single red wine rather than splitting it throughout the pairing. It also just wasn't a very good set of wines, with three of them being very, very sweet. Additionally, there were a few issues with the wine service in general. We watched the server open two of the bottles and pour them directly to us without tasting them, or even glancing at the corks. Even more amusingly, one bottle ran out as she poured it for Emil, and she opened a new one and poured directly into his glass that was half filled from the first bottle. The red wine was served rather cold. I'm not enough of a wine connoisseur to notice these sorts of things myself, but other members of my party were quite bothered by this. Service was generally decent, but not particularly friendly. We were seated for quite a while before our order was taken, or before anyone seemed to acknowledge us (I wasn't paying close attention, but I wouldn't be surprised if it was at least 15 minutes). And we were fairly insulted by a comment the waiter made several times regarding our dislike of the dessert (see dessert review for full details). But overall, service was smooth. Overall, the food was all good (with the exception of the horrific foie dessert), but nothing really stood out. Very little creativity, no flavors that really popped, and just really not right for the price. But everything was well prepared and nicely presented. 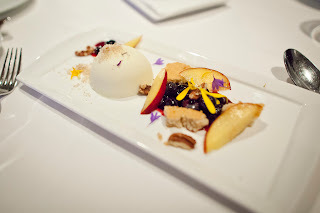 I would like to go back and get some of the regular dishes, in particular, I'd love to try the savory panna cotta since the one we had at Taste of the Nation was so incredible, and I'd like to try more of the desserts (since they all sound pretty much amazing and the one we did order was quite good). 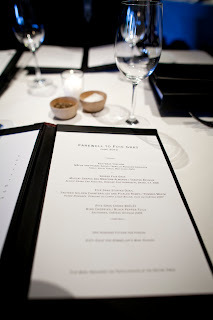 The Farewell to Foie menu. 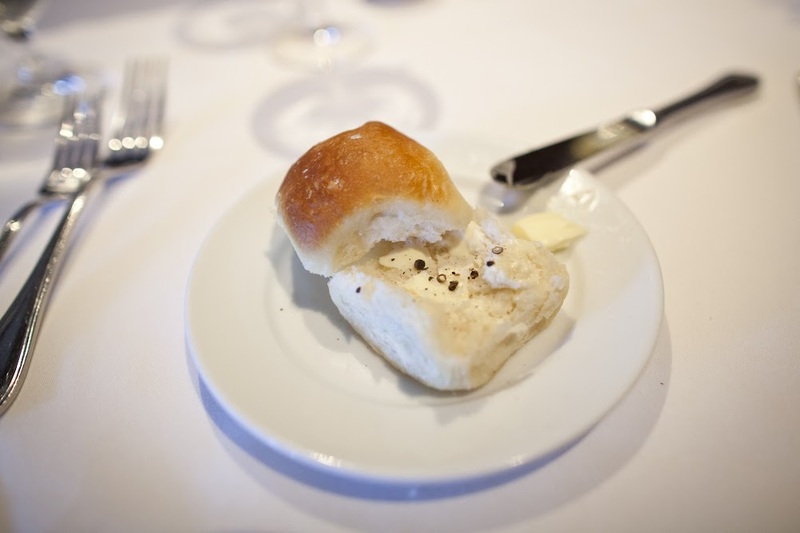 Bread service was accompanied with a good quality butter, flavorful salt, and pepper. Bread service included 3 options: parker rolls, pain levain, or baguette. All were disappointingly served cold. I did not try the pain levain. The Parker roll was better than average, soft and fluffy, with a slightly crisp crust, and a nice sweetness. If it were warm, I would have loved it. My and one other diner's 5th favorite dish of the night. The baguette was a sweet, not sour style with a good crust, but otherwise forgettable. Bread was offered many times throughout the meal, they certainly did not skimp in this area! While I liked the Parker roll, these were fairly standard bread offerings, and not particularly notable. 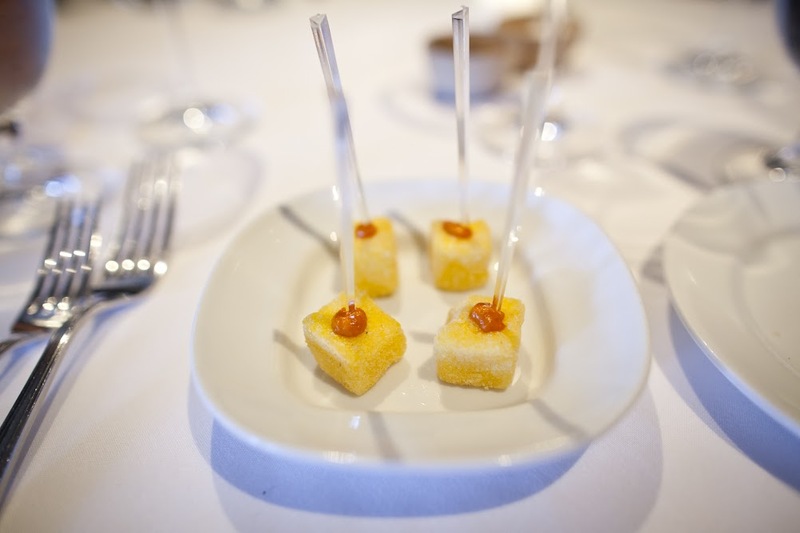 Amuse Bouche: Crispy polenta with romesco sauce. 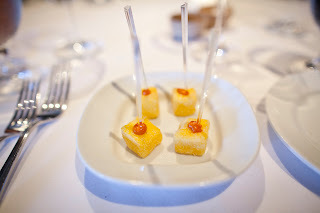 These were a cute amuse, served on little sticks! They arrived piping hot. The polenta had a great crust on the outside, yet was soft on the inside. It reminded me of some polenta fries I've had in the past. Good corn flavor to it and nicely salted. Unfortunately, there wasn't enough romesco sauce to taste it. I love romesco and think it would pair wonderfully with the polenta, so I really wished there was more. Definitely a tasty bite, and started things off on a high note. My and Emil's 4th favorite dish of the night. First Course: Foie Gras Torchon / Mache and Frisée Salad / Vanilla Poached Apricots. 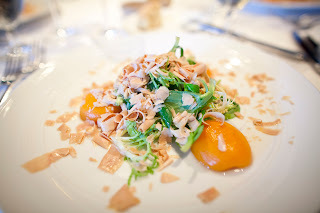 The starter was a salad, topped with shaved foie gras torchon, with poached apricots on the side. The mache and frisée were crisp and fresh tasting. I liked the slight bitterness to them. The shaved torchon had a really strong foie flavor, much more pronounced than many torchons I've had in recent memory. It was lightly salted, and the seasoning level paired well with both the greens and the foie itself. A very nice torchon for sure, and the shaved technique worked really well with the salad, complimenting it in both flavor and texture. The vanilla poached apricots were very, very sweet. We all found that they overpowered the foie. They were nicely cooked, soft but not mushy. But just far too sweet. Had the sweetness been scaled back, I think they would have paired nicely with the slightly bitter salad greens and the rich foie, but as was, they were almost inedible in any large portion. The waitress said there was 2 ounces of foie on here, but it seemed like less. I really enjoyed this dish, and with a slightly different pairing (either less sweet apricots, or perhaps strawberries?) I think it could have been a home run. My and Emil's second favorite of the night, and one other diner's third, but would have far and away been my first had it not been for the apricots. The torchon was well flavored and I really liked the shaved execution with the crispy salad. This dish was paired with a tokaji (Royal Tokaji, Mád Cuvée 2009) that was really very sweet. Had it not been for the apricots, I probably would have liked the pairing, but as it was, I found it to just be too much sweet, particularly so early on in the meal. I do love tokajis though, so I blame the apricots, not the wine. 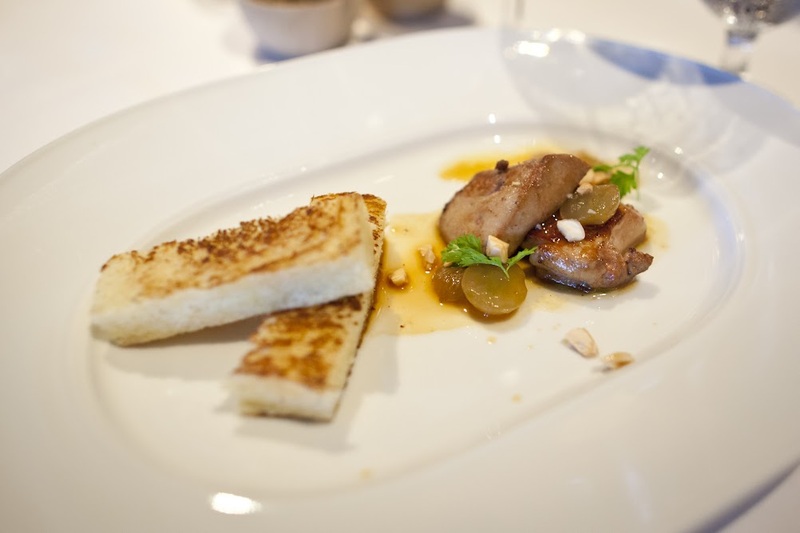 Second Course: Seared Foie Gras / Muscat Grapes and Marcona Almonds / Toasted Brioche. The seared foie was warm, but not hot. It had an ok sear to it, but certainly could have been seared a little more. It had good flavor, was creamy, and clearly a good quality piece of foie. Nothing particularly notable about it, a fairly standard execution. The toasted brioche was the perfect level of crispy, buttery, and a good pairing. Also on the plate were some muscat grapes and sliced marcona almonds. The almonds added a crunch, but not much else, and didn't really need to be there. The grapes added a slight sweetness that went well with the foie, but weren't particularly flavorful. The waitress said this was two ounces, which seems about right. This was a fairly small portion, which I think was good for a four course menu, but not given the price of it. Overall, this dish felt like a good, but standard execution of a seared foie, with fruit component, and toasted bread. Nothing particularly creative about it, nor any flavors that really popped. It was my and Emil's favorite dish of the evening however, and the second favorite of another diner, who commented "the portion was small and it doesn't stand out in my mind as being especially phenomenal, but seared foie is always delicious". That about sums it up! Paired with a Alsace Grand Cru Riesling, Domaine Zind Humbrecht, Brand, Vendanges Tardives 2006. This was less sweet than the Tokaji, and more enjoyable to drink with the food, but it seemed like perhaps this would have gone better with the first course, which didn't need the overpowering sweet Tojaki, and I think the seared preparation could have stood up to it better. 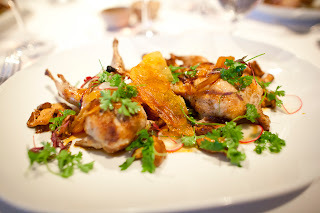 Third Course: Foie Gras Stuffed Quail / Golden Chanterelles and Pickled Ramps / Pommes Maxim. The main course was foie gras stuffed quail. Unlike the first two dishes, this was a very generous portion, two whole quails! This was the course I was least excited about. It pretty much matched my expectations. I just can't seem to get into small birds ... quail, squab, etc, they just don't excite me. Not that bigger birds are much better, I really dislike turkey and chicken is inoffensive, but uh, just chicken. This was probably the best quail I've ever had though. It was tender and nicely prepared, just really not my thing. So much work to extract the meat from the bones and basically all dark meat (I know, I know, what kind of foodie I am, I only want white meat ...). Also accompanying the squab was a plentiful number of golden chanterelles, which had a really nice earthy flavor, but were a little too oily for my liking. I'm not sure if they were roasted and then pan finished, but they soaked up too much oil and were kinda glistening, which detracted from tasting their deliciousness. There were only a few pickled ramps, I would have liked to see more of them, as they were fairly tasty as well. The pommes maxim were just thin sliced fried potatoes, like a crispy potato chip. Good enough, but didn't seem to fit in with the dish all that well, as they came in one big sheet that you needed to break up, and were then hard to scoop up with other bites. Finally there were also some very thin slices of radish, that seemed totally out of place, along with a bunch of parsley. Meh on the garnish. I didn't find ANY foie in this dish. I didn't see it, nor taste it. And I dissected the squab, really looking for it! One other diner however did find several chunks of foie inside of his, and incidentally, this was his favorite dish, whereas it was my 7th pick of the evening, and Emil's 3rd. This was paired with a very nice red wine, a Vosne-Romanée, Domaine du Comte Liger-Belair, Clos du Château 2007. A big wine with a subtle finish, and really quite fantastic. The only issue is that it was served far too cold. My dining companions were so upset by the temperature of the wine, that they held their glasses over the candle on our table to warm them up. This was sad because it was such a fantastic wine! They loved it, and each also each got a full second glass of it, and were slightly sticker shocked when the bill arrived. It is clear that this is where the majority of the cost of the wine pairing was. I forget exactly how much it was by the glass, as it is not normally offered that way, but the bottle is usually $380. (I was only doing a half pairing, and the server accidentally poured me more than half of this one, and looked visibly upset when she realized her error ... I didn't quite understand why then, but I do now!). Anyway, a fantastic wine, but not a fantastic dish. 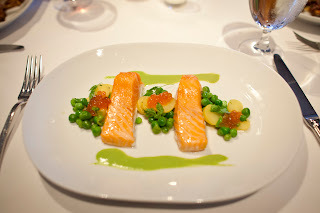 Regular Main Dish: Slow Roasted Wild King Salmon / Spring Peas and Sorrel / Salmon Caviar. $35. We had one diner who didn't order the foie gras dinner. He opted for this amazing sounding salmon, and nicely shared with me (I tried to give him quail in exchange, but understandably, he didn't really want to take me up on that trade!). I've been loving local salmon so far this season. This however was a little disappointing compared to some of the salmon I've had recently, as it just didn't have much flavor. It was really nicely cooked, medium-rare. If the menu didn't describe it as slow roasted, I definitely would have thought it was poached, as it didn't have any sort of crust on it whatsoever, and was amazingly tender and consistently cooked throughout. The peas were fresh and slightly crisp, a nice spring component. There were some forgettable slices of potato and a somewhat flavorless ramp puree also on the plate. And ... the "salmon caviar". The menu listed it this way AND the server presenting it said it. Emil was dying. The ROE wasn't flavorful at all. I liked this more than the quail, making it my 6th favorite dish of the night. There was a lot of potential here, but it just came out pretty bland and flavorless, lacking flavor in the fish itself, but also no real saucing or spicing either. Definitely not a $35 dish. 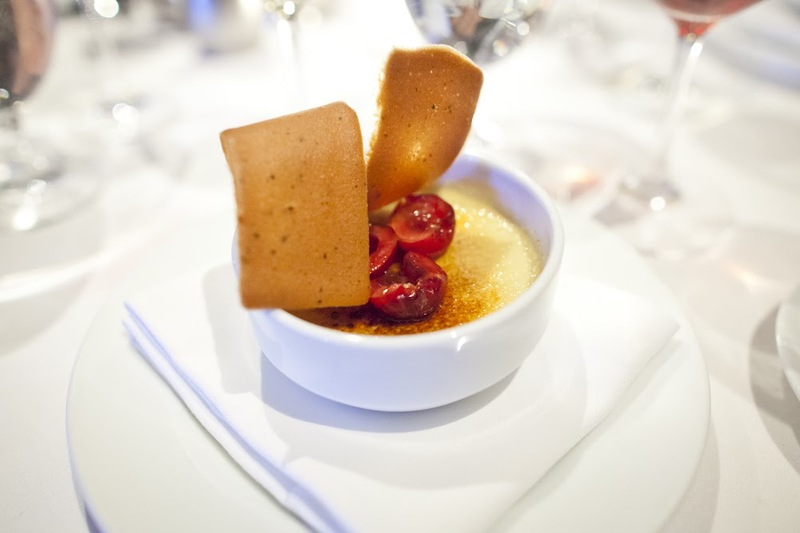 Fourth Course: Foie Gras Crème Brûlée / Bing Cherries / Black Pepper Tuile. This is the dish I was most excited about from reading the menu in advance. In fact, they had offered this dish a few months ago and promised to run it again in June, and I've been watching their web site for it to show up every since. And it did! You know I love foie gras. You know I love desserts, and crème brûlée in particular. This had my name all over it. The black pepper tuile was sort of like a peppery waffle cone. It wasn't all that peppery, nor sweet. Just kinda there. The cherries on top were sweet, ripe, and quite delicious. The brûlée layer on top was very thin and didn't impart any caramelized flavor into the dish. These things were all just not very good, but the real issue was the custard itself. It had a strange, gritty consistency. Certainly not like any crème brûlée I've ever had before. Even stepping back, and taking away the name of the dish to re-adjust my expectations, the consistency was unlike anything I've ever experienced before, in any sort of pudding or custard. It had a horrible mouthfeel. But worse, was the taste. It was sour. Really bad. Really, really bad. Every single one of us strongly disliked this dish. We all gave it a few fighting chances, taking a few bites, trying to mix in the cherries and the tuile, but it was truly vile. It was paired with yet another sweet wine, a sauternes (Château Guiraud 2005). I actually really liked this, but I love sweet wines. It wasn't quite as syrupy or cloyingly sweet as the tokaji we started with. This is how I left the dessert. This is monumental. I am a dessert-o-holic. I ALWAYS finish desserts, even when I don't like them. I couldn't get through another bite of this. Emil, who hates sweets, was chugging his sauternes in attempt to clear the flavor, claiming that anything was better than the taste of this. He gave up on that technique and went running to the rest room to rinse out his mouth. We told the waiter that we all really disliked it, and his response to us was "yes, well, foie gras crème brûlée isn't for everyone", and then he walked away, leaving it with us. Um. Ok, so I think the "customer is always right" line is total crap, and clearly, customers are not always right. But his response was really a little insulting. I think I tried another bite at that point trying again to see the goodness in the dish. There just wasn't any. It was really, truly, one of the most nasty things I have ever tasted. Now, let me just say, I'm not a stranger to foie gras based desserts (or to foie gras crème brûlée even). I've had a number of foie based desserts at the different Alexander's foie dinners, or Lafitte's dinners (like the amazing foie gras donuts with coffee cream, foie gras vaudovan caramel, and a brandied foie gras cereal milk shooter or the less good foie gras pain perdu with foie gras ice cream) or even from regular dessert menu at Fifth Floor (a downright mind blowing fried rhubarb pie with foie ice cream). 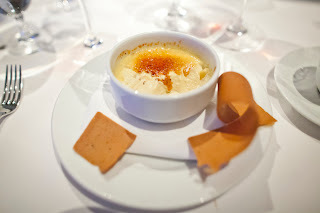 And I've had all sorts of other savory custards, like the amazing uni crème brûlée at Quince. And savory foie custards, like the parfait at Cyrus. And more creamy foie mouses that I can even count. I can safely say, that the blanket statement that "foie gras crème brûlée is not for me" does not apply to me. When the waiter came back a while later, we tried to express how bad this dish was. I honestly do not believe that it came out as intended. Both the texture and flavor were so bad that it seems inconceivable that anyone could have possibly wanted it this way. But he again sorta laughed at us and said the same line about it not being for everyone and asked if we wanted to see the regular dessert menu instead. I'd actually read that they do fabulous desserts there, and they all sounded amazing, so we decided to order one. While we waited, we ordered coffee. Two people ordered espresso based drinks, and two of us ordered the decaf coffee. As you know by now, I was a huge coffee drinker, but cannot have caffeine in the evenings, so if I want coffee, it has to be decaf. And decaf is ... usually quite horrible. I asked about how theirs was, and he told me that they have a house roaster, that it is swiss water decaf, and quite good. And it was. Fairly complex, a really decent decaf. Served in a little carafe to keep the remainder warm. 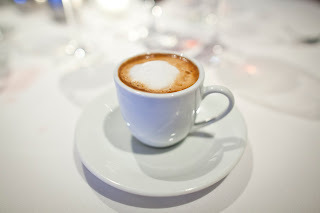 The server who presented it to us even clarified that it was decaf as he sat it down (something I normally ask, as unfortunately, some very large number of times is wrong). A good coffee service! 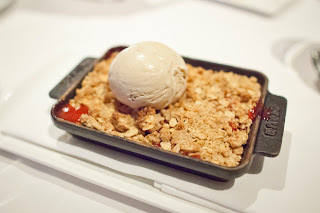 Regular Dessert: Strawberry and Rhubarb Crisp / Cinnamon Ice Cream. $11. The dessert I picked. I'm a sucker for warm pie and ice cream. One of my absolute favorite things on this planet. And I just adore crisps/cobblers/crumbles/etc. And it is strawberry season. I don't care for rhubarb much, but I can deal with it. This was quite good. Served really nice and hot, clearly fresh out of the oven, in a hot vessel which helped retain the heat. The fruit was a little too sweet for my liking and contained far more rhubarb than strawberry, but was pretty good overall. The crisp on top was oat based and really perfectly crisped up. The ice cream was creamy, rich, with a great cinnamon flavor. The pairing was perfect. Warm crisp. Cold ice cream that melted into it. Ah, I love that sort of thing. Flavor-wise, the cinnamon ice cream was also amazing, complimenting the flavor in the crisp perfectly. My third favorite dish of the night. I'd definitely order other fruit crisps of theirs in the future. Regular Dessert: Buttermilk Parfait / Blueberry Compote / Brown Butter Financier. $10. 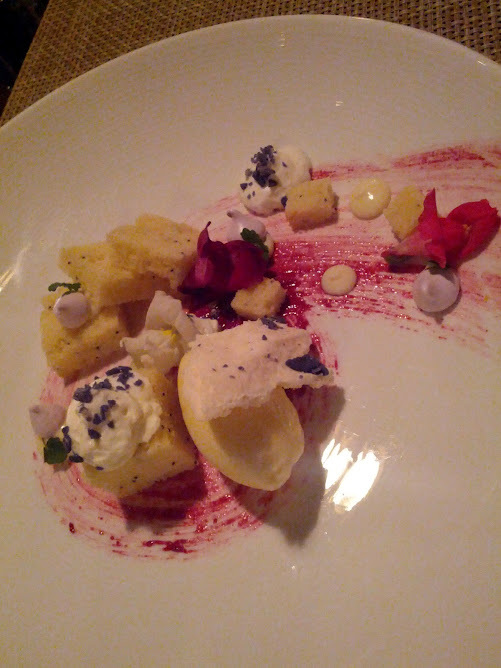 The waiter also brought us this bonus dessert, a deconstructed parfait. The buttermilk component was not very sweet, with a nice buttermilk flavor to it. It wasn't ice cream, but it was a firm consistency. I didn't really like it. I liked the idea of a less sweet dessert, but something more like mascarpone would have worked better. The blueberries were flavorful and sweet, with the flavors enhanced by the syrup that made up the compote. The slices of peach fairly good as well. And of course, cute little edible flowers to decorate the whole thing. And a couple pecans. I did really like the brown butter financier chunks. Really buttery yet light, with a great brown butter undertone. A composed bite of the buttermilk, some fruit, and chunk of the cake came together pretty well, but this still wasn't that great to me. Something just a little different with the buttermilk component and I think I would have really enjoyed it. 4th favorite dish for one diner, but second to last for me (but far, far above the foie gras crème brûlée). These were very very soft. Nice buttery flavor. But not very memorable. Friday night, I wanted just a little more food after eating a ton at TGIF that evening. Something light, like some raw fish. And Emil, as always, wanted foie gras. So, we headed to our goto place: Alexander's Steakhouse, to grab a quick bite at the bar. This is one thing I adore about Alexander's - where else can I get quality sashimi, while dining with someone who is eating a steak topped with foie? They are so much more than a steakhouse!!! Since I've reviewed Alexanders about a thousand times, I'm skipping all the details not related to the dishes we actually had that night. This review is also less detailed in general, as I wasn't really taking notes, and was just enjoying a casual evening. Service was fantastic, the staff friendly as always, particularly the bartender who we chatted with while dining at the bar, and the chef who gave Emil some tips on making his own torchon! Our amuse was a little gougère. It was served cold, which was disappointing, particularly after the insanely amazing gougères we had at Cyrus a few weeks ago, filled with a hot, melted gruyere. This one was fine, but nothing remarkable. I liked the parmesan powder on top, it was intensely parmesan flavored and really did wake up my palette! But man, now I just want the Cyrus ones again! Intermezzo: Blackberry gelee, kumquat pearls. 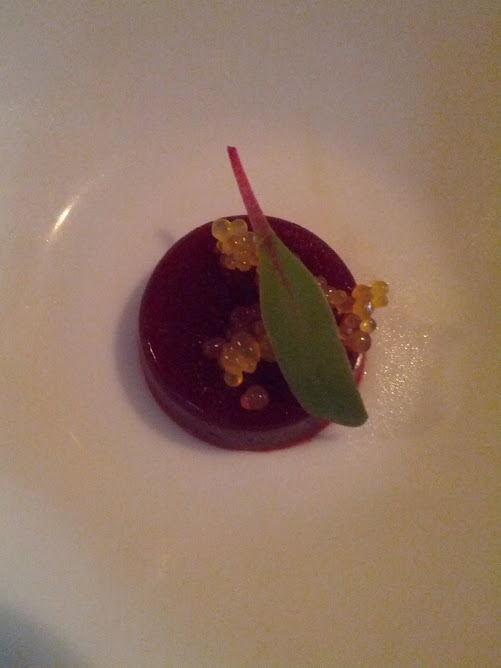 Our intermezzo was a little blackberry gelee, which had a strong blackberry flavor. I didn't really taste the kumquat in the pearls, but they added a bit of pop. Not sure what the leaf was. Emil thought it was too sweet of course. 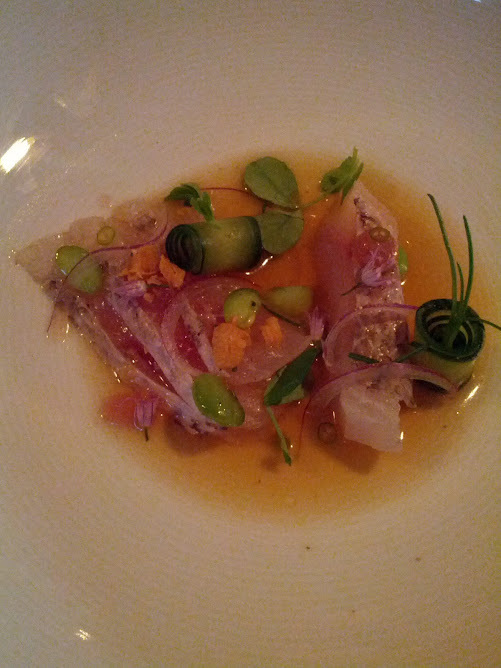 Tai Sashimi: Japanesse snapper, cucumber, violet, agretti, black bean dashi, red onion. $17. What a beautiful dish! Yes, I was at a "steakhouse", but I was getting raw seafood, with this incredible presentation. This is what I adore about Alexander's, it is just soo much more than a steakhouse! The tai was served as 4 generous cuts, skin on. It had a good firm texture, but wasn't very flavorful. It wasn't bad, it just wasn't particularly good. 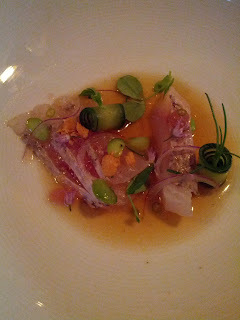 I had tai sashimi the next night at Atelier Crenn as well, and was similarly disappointed by it. I haven't had a lot of raw tai, so I don't have many comparison points, perhaps this is just a fairly mild boring fish in general? The dish included some lightly cooked edamame, that were a really nice texture, and added to the Japanesse feel of the dish. There were also some thin slices of red onion that complimented the fish well, along with agretti and some other herbs that I couldn't identify. The cucumbers were very thin slices from the entire cucumber, rolled up. They were fresh and flavorful. The dashi broth was very light and didn't have as much flavor as I'd like. I'm not quite sure where the violet was, perhaps in the crispy things on top? The entire dish was light and refreshing, which is what I was going for, but somehow didn't quite come together for me. I wanted more intense flavors. There was a tiny slice of jalapeno (?) that really completed the dish for me. The bite I had that contained the kick from the pepper was really quite good, but unfortunately, I only had one such bite. My other bites just didn't have a whole lot of flavor pop. I'm glad I tried it, but I wouldn't order again. 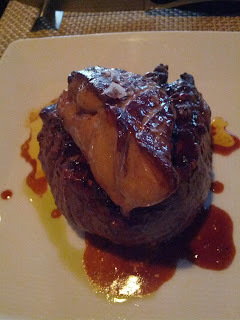 10 ounce grilled filet mignon ($47) topped with seared foie gras ($22). Emil of course ordered his regular dish, the filet mignon, with seared foie on top. He orders it rare, and they always deliver it perfectly executed with a giant hunk of foie. I'm more of a medium-rare girl, so I just had a couple bites of this from the edge. It was tender, with a great sear, and a flavorful crust. The foie of course was creamy and delicious and added to deliciousness the dish (though, I'd personally prefer a tiny bit more sear on it). This is a reliable classic, always worth getting at Alexander's. Brand new dessert, I didn't get the name of it. $12. They had a new dessert on the menu tonight, and knowing what a dessert-o-holic I am, they sent it my way. I didn't catch the name of it, nor the full description since I wasn't expecting it, so I'm certainly missing details here. The main component was a lemon poppyseed cake. It was served in a large chunk, several medium sized chunks, and some small cubes. It had a great lemon flavor, a nice crunch from the poppyseeds within, and was quite moist. I'm not really a fan of this style of cake in general however, and I'm particularly just really sick of lemon, so I didn't love it. But, if you like this sort of thing, this was really well done. The cake was accompanied by some lemon ice cream. 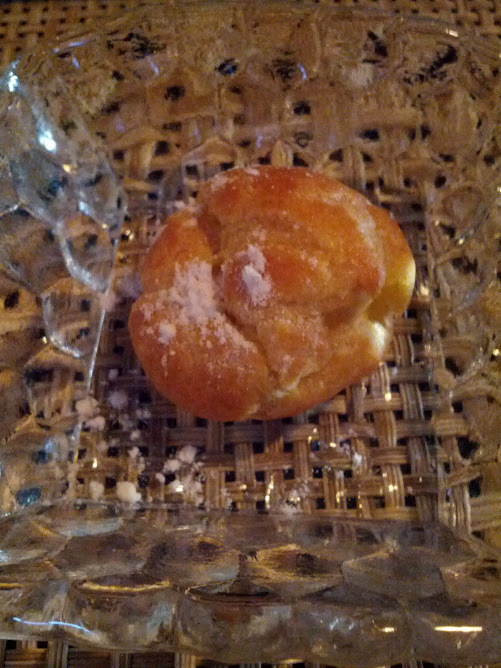 It was creamy, very strongly lemon flavored, and fairly sweet, but balanced by tartness from the lemon. Again, I'm pretty sick of lemon so I wasn't into this, but surprisingly, Emil was, due to the tartness. The rest of the plate was a bunch of components I love: Tiny little violet meringues! Violet cream! Candied crushed violet petals! The tiny purple meringues were adorable. There was also hard style meringue that was crisp and way, way too sweet, even for me. Perhaps it would have gone well with the tartness of the lemon, but it seemed like sugar overload. The cream had a very subtle violet flavor. I absolutely loved the crunch and taste of the candied violet. I wouldn't order this one again, but entirely because it is just things I don't generally care for, as everything in the dish was well done, and lemon and violet are a lovely combination. This is normally part of the elaborate "Tropic Thunder" dessert. I have a serious thing for pudding based desserts (rice puddings, tapioca puddings, mousses, crème brûlée, etc). 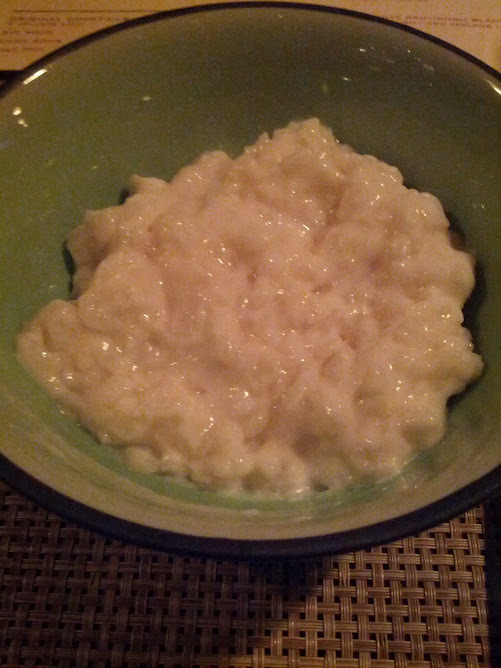 But I really wasn't in the mood for a huge dessert, and I really have been kinda anti-passionfruit lately, which the real dessert features prominently, so I asked for just a bowl of the rice pudding. They nicely obliged :) The rice was cooked nicely, firm but not crunchy, the pudding was creamy, and it had a slight coconut flavor to it. A little boring on its own, but this isn't how they intend you to eat it, as the real dessert has a slew of other components. I actually couldn't finish it all that night (they brought me a very large bowl full! ), so I took it home and enjoyed it the next day with fresh strawberries and blueberries on top, and it was delicious! I'd love to see more rice pudding dishes on the menu, preferably without passionfruit, so I can enjoy it again! Not pictured was our cherry cotton candy (really, really intense awesome cherry flavor!) and our mignardises (one of the violet meringues, a black sesame macaron, and a tiny cake). We've dined in the bar at Prospect a number of times, as it is right across the street from work. In general, we've been very happy with the cocktails, enjoyed the bar snacks, but been a little disappointed with the main dishes. They recently brought on a new chef, so we were excited to see what he's been up to. As usual, since I've reviewed Prospect many times before, I'll skip the general details and let you read about them in my older posts. We came in for some light snacks and of course, foie gras. This was probably our best food experience at Prospect, so I'm very optimistic about what the new chef is doing, and can't wait to check out some of his new main dishes, and of course, the burger and fries that I've somehow still yet to try! We sat at the bar, and really enjoyed the friendliness of the staff. They were very busy as usual, but always made a few minutes to chat when they checked on us. It was an enjoyable time, and we'll certainly be back. 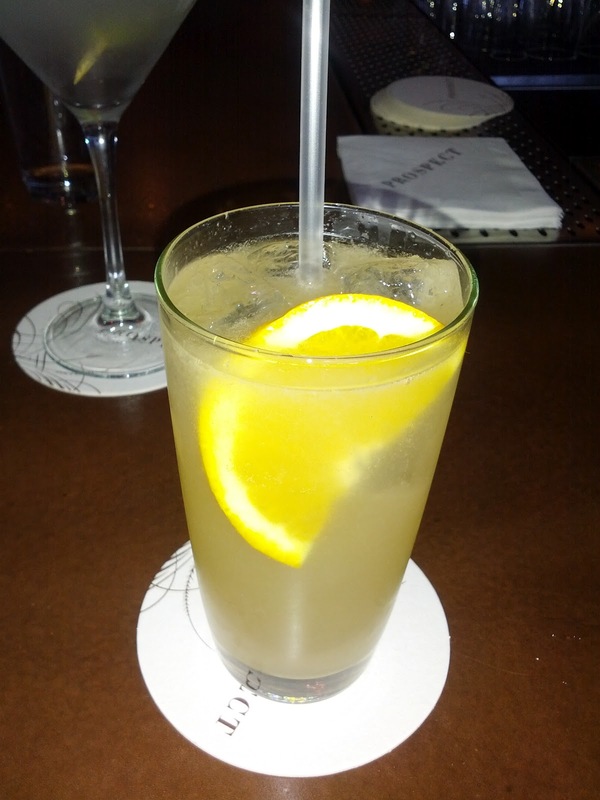 Pompelmo Frizzante: Vodka, Sparkling Wine, Grapefruit, Vanilla, Lemon. $10.50. I've really enjoyed all of the cocktails I've tried at Prospect, as they tend to be really well balanced. This was no exception: sweet, but with some sour notes from the citrus as well. Refreshing and enjoyable. French Onion Dip, Potato Chips. $5. We didn't order this, but the bartender gave it to us as an extra treat. It was pretty much the same as before. 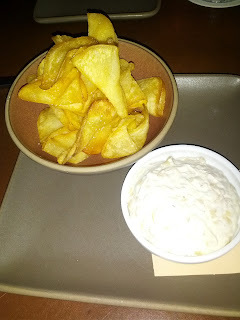 I wouldn't get it again, but if you are craving chips and dip, it is a good execution. Smoked Salmon Spread, Black Lavash Crackers. $5. The crackers (more like chips) were the same ones we saw last time in a smaller form in the wild salmon crudo. I really liked them. 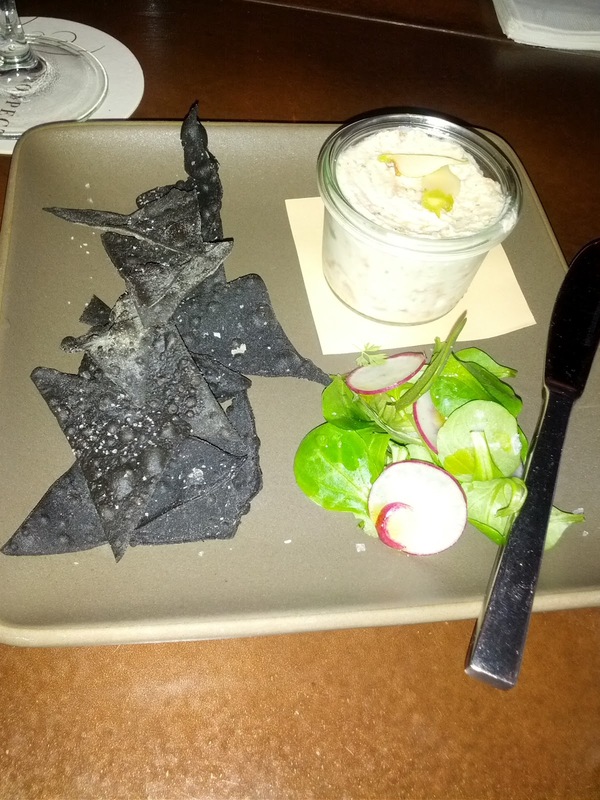 They were salty and had a subtle flavor from the squid ink that colored them, and added to the overall seafood flavors in the dish. Crispy and fresh, not too oily. The smoked salmon spread had pretty large chunks of smoked salmon in it, with a good salmon taste, but not as smokey as I would have liked. The ratio of creamy base to salmon seemed a little off to me, too much of the cream cheese (? ), as it overwhelmed the salmon flavor. On the side was a little salad made from radish and arugula, dressed with a simple salty dressing, that was refreshing and paired well. Emil really enjoyed this and at $5 it was a generous portion and good value. Hot & Cold Sonoma Foie Gras: Plancha Seared, Terrine, Sicilian Pistachio, Local Strawberries, Aged Balsamic, Pistachio "Biscotti". $22. And the reason we were there, to check out the new foie gras preparation, a starter on the regular menu. It featured both a hot and cold preparation, my favorite, as I can never pick! The hot version was simply seared. It had a decent sear on it, was served fairly warm, was nicely salted, and was pretty creamy and high quality. It did have a few large veins in it however. Good execution, but could be improved slightly by being served warmer, with a little more sear. On par with most seared pieces we've had lately. It was served on top of a very crispy, very oily, piece of toast. It was too oily for my liking, but paired nicely with the foie. The foie was also brushed with an aged balsamic, which added a subtle sweetness. The cold version was a terrine. It was incredibly creamy and smooth, nicely salty, and had one of the strongest foie flavors of any terrine or torchon I've had lately. This was one of the best cold preparations we've had in ages. Really nicely done. The terrine was topped with a layer of strawberry gel, and there were some very flavorful compressed strawberry slices on the plate as well. They were sweet and a good pairing. Also with the terrine was a pistachio cream and a pistacho crumble. I liked the crunch the crumble added, particularly given how creamy the terrine was, but pistachio isn't one of my favorite flavors, so I wasn't thrilled with this component. There were also what was described as pistachio biscotti. They were mush softer than they looked, and were packed with pistachio flavor. If you like pistachio, you would probably like these, and the pairing with foie went well. Finally, there was some lightly dressed watercress. It was super bitter, fresh, and really enjoyable. This was a very successful foie preparation, and makes me very excited to try out more dishes by the new chef! Our favorite dish of the night, and at $22, a good portion size for the value.